Catawba Falls – Located just south of Old Fort, the trailhead for Catawba Falls is about 20 minutes from the Inn on Mill Creek B&B. The Catawba Falls trail meanders along the headwaters of the Catawba River, on forested land. Prepare to get your feet wet as you cross the river at a couple of shallow spots along the way. 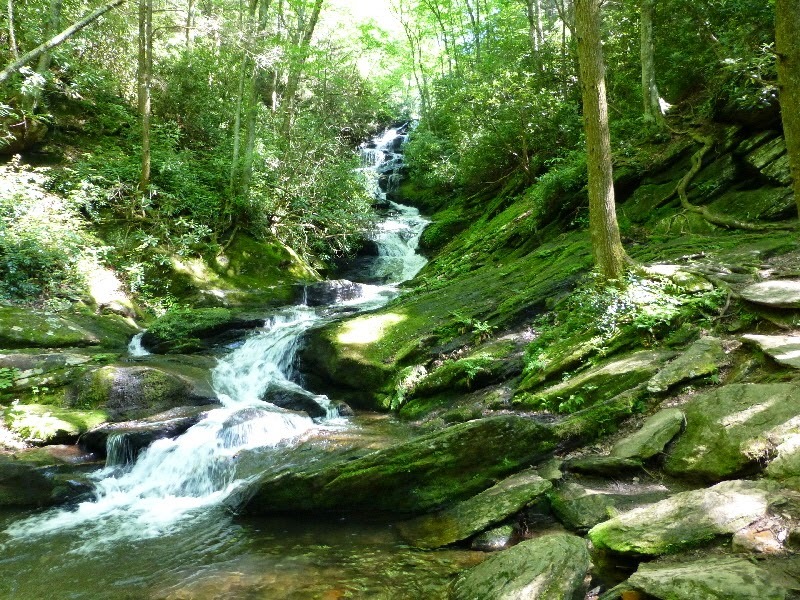 The trail is about 3 miles round trip, and leads to the base of Catawba Falls, which cascades hundreds of feet over large rocks. Note that this waterfall hike can be rather busy on the weekends, and is very popular with hiking groups and families. Roaring Fork Falls – The trail for Roaring Fork Falls is actually an old Forest Service road, just north of the Blue Ridge Parkway off Highway 80, approximately 40 minutes from the Inn on Mill Creek. It’s an easy trail, about a mile in length one way. The waterfall does a zig-zag down to a pool at the base of the falls where the trail leads. Moss-covered rocks and trees placed perfectly by Mother Nature add to the appeal of Roaring Fork Falls, as well as the fact that it sees fewer people than most waterfalls in the area. Want a quiet hike to a peaceful spot? This one’s for you. Toms Creek Falls – Just a few miles off Highway 221 north of Marion and 40 minutes from the Inn on Mill Creek is the trailhead for Toms Creek Falls, a nice 80-foot waterfall inside Pisgah National Forest. The trail is a little more than 1.5 miles round trip and is considered one of the area’s easier hikes. You can see a description of the trail and photos via our friends at RomanticAsheville.com. Douglas Falls – Craggy Gardens, about 45 minutes from the Inn on Mill Creek and north of Asheville on the Blue Ridge Parkway, is an area of the North Carolina mountains known for its gorgeous rhododendron blooms in the springtime and its stellar views looking down on the Black Mountain range as the leaves change color in the fall. A lot of people don’t realize there is a waterfall hike there as well. With an elevation gain of 1,300 feet, switchbacks and stream crossings, plus a distance of 6 miles (round trip), the strenuous trail to the 70-foot Douglas Falls is suited for avid hikers. For a description and photos, check out www.ncwaterfalls.com/craggy1.htm. Linville Falls – Easily accessible from the Blue Ridge Parkway and Highway 221 north of Marion, NC, Linville Falls is close to Grandfather Mountain and Linville Gorge, making it great for a day trip to that section of the mountains, which is about 45 minutes northeast of the Inn on Mill Creek B&B. Linville Falls is quite dramatic and in a beautiful area. For a description of hikes around the falls and photos, check our Linville Falls blog post. 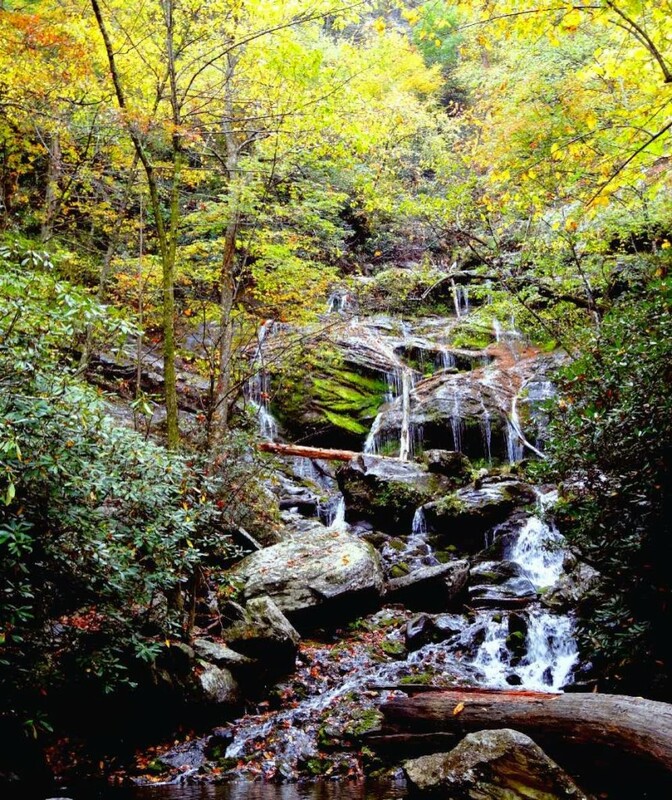 We have maps for guests of all waterfall hikes, so be sure to ask when you stay with us if you’re interested in seeing a waterfall during your stay in the North Carolina mountains near Asheville.